Anne Koehlinger is an active volunteer with her church, Holy Family Parish. Anne Koehlinger taught elementary school students about food preparation. 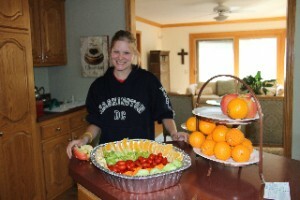 Anne Koehlinger is a high school senior currently studying at Illinois Virtual School for College Prep. She has always had a passion for culinary arts and plans on pursuing her Bachelor of Arts in Culinary Studies in hopes to one day open her own business. During a family trip to Paris, France, Anne Koehlinger had the opportunity to visit Café Med and St. Catherine’s Bistro and met the chefs at Capella Pedregal. Being able to share this experience first hand with others that foster the same enthusiasm for fine dining has really had a lasting impact on Anne Koehlinger and ignited her passion for culinary arts. Rather than waiting until college to practice and study culinary arts, Anne Koehlinger participates in many community outreach programs. She is an active volunteer with her church, Holy Family Parish in Illinois, and has also prepared food for the Public Action to Deliver Shelter (PADS), a homeless support outreach effort affiliated with her church. Anne Koehlinger has taken her passion for culinary arts and has shared it with many young students. In 2011, she worked with the church’s Food Assistance Program and taught elementary school students about food preparation. One of her favorite topics to discuss with young students is the art of decorating cupcakes. She enjoyed giving back to the community so much that in 2012, she taught another class on cupcake preparation as part of a community outreach project. During February and March of 2012, Anne Koehlinger prepared cupcakes and brought them to a classroom at Rose Elementary School, which gave students the opportunity to learn how to decorate their own cupcakes. There is no doubt that Anne Koehlinger is passionate about her community as well as culinary arts. With her Bachelor of Arts in Culinary Studies, she will be able to pursue her goal of owning her own business while still sharing her talents with her surrounding community. Learn more about Anne Koehlinger on LinkedIn or connect with her on Google+: https://plus.google.com/104503175055337353915/posts.